This DirectVent Pro 3-Inch x 25-Foot Aluminum Chimney Liner is exactly what you need when converting your masonry chimney to a Dura-Vent's Co-Linear direct vent system. Constructed with two layers of flexible .010" aluminum, this liner has no problem standing up to extreme heat and frequent use. This DirectVent Pro 3-Inch x 35-Foot Aluminum Chimney Liner is exactly what you need when converting your masonry chimney to a Dura-Vent's Co-Linear direct vent system. Constructed with two layers of flexible .010" aluminum, this liner has no problem standing up to extreme heat and frequent use. Converting a masonry chimney in to an efficient direct vent system is easy with a Dura-Vent DirectVent Pro Co-Linear Chimney System Top Termination Kit. This convenient kit, when used in conjunction with two separately purchased 3-in. diameter aluminum chimney liners, allows you to install a direct vent appliance into an existing masonry chimney. Your customers will love how this dual-vent system uses equipment they already have, and you'll love how little time is needed to set it up. Dura-Vent is well-known in the hearth service industry for producing reliable and cost-effective products. Their DirectVent Pro line illustrates exactly why they have earned such a reputation. Approved for use with most direct vent appliances, the DirectVent Pro venting system includes a variety of convenient items, such as this Co-Linear Chimney System Top Termination Kit, to help every installation go as quickly and smoothly as possible. And homeowners always like this line because, in addition to providing attractive and efficient venting, each piece comes with a limited lifetime warranty. With DirectVent Pro, everyone wins. Please Note: Two separately purchased 3" aluminum liners, one 4" x 6 5/8" DirectVent Pro vertical rain cap, and an appliance connector are required for installation. * Please Note: The Surround Panels for this unit come standard with matching black trim. Gold or Nickel finished trim can also be purchased from the drop down above, but can not be considered an exchange for the black trim. Black trim will still be included as well if gold or nickel is selected. 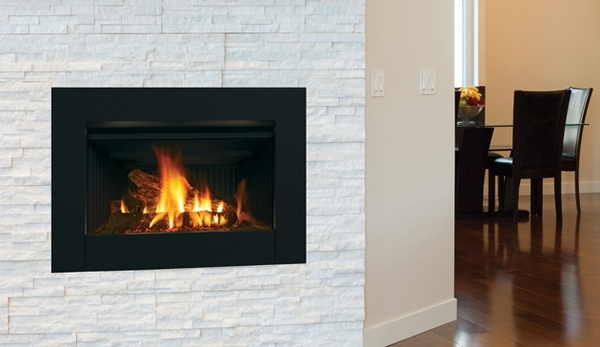 If you're looking for a sleek, modern-looking fireplace insert that will work with almost any zero-clearance fireplace, consider our popular Superior DRI2530 Direct Vent Gas Fireplace Insert with Electronic Ignition. It's available in a variety of sizes (see below) and comes with a warranty. Add gold or nickel trim, if you so choose. You'll enjoy the warmth of this attractive 33,000 BTU fireplace, and you can also enjoy the convenience of an optional remote control as well as battery backup in case of electrical failure. When ordering, please specify propane or natural gas. Your home will be a more beautiful, warmer place when you install this attractive fireplace insert. Are there remote controls to turn this unit on? Yes this unit can be operated by remote. Can a vent free fireplace have a glass front on it or does it have to be open at all times? Thank you. More often than not, ventless gas fireplaces will be open as they draw in combustion air from the living space to produce a clean burn with the only byproducts of combustion being water vapor and carbon dioxide, however, there are certain models like the Empire VFL28IN92N Loft Vent-Free Fireplace that offer an optional closed front with openings around the perimeter of this front to draw in combustion air. Can this unit be used during a power outage for back up heat? It can indeed. The unit features a battery backup that allows the ignitor to function in the event of a power outage.